NB Kindle Version has clickable Table of Contents. 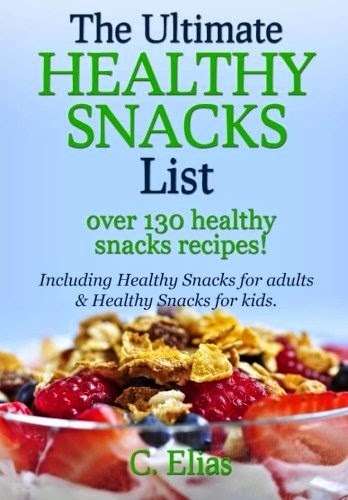 "...delicious and healthy snack ideas for everyone""you will find ideas and combinations you have never thought of..." "delicious and simple..." "full of new ideas""...exceeded my expectations...""Fabulous, five stars. Thank you to the author for putting everything in one place!" Oaty Fruit Bars, Fruity Oat Polynesian Bars, Peanut Butter and Banana Burritos, Homemade Fruity Granola Snack, Granola & Yogurt Crunch, Night-time Blueberry Snack, Fruity Popcorn, Gluten-free sandwich bread, Gluten-free, sugar-free, yeast-free, egg-free bread, Apple Bread, Banana Bread, Lentil Pasta, Protein Packed Fruity Smoothie, Strawberry Delight Smoothie, Fruity Cream Smoothie Very Quick Milky Smoothie, Quick Coconut Banana Smoothie etc. Chicken Lemon Salad Sandwich , Chicken Taco Pockets, Creamy Tuna Spread, Greek Quesadilla, Half-time Beef Sandwiches etc. This amazing handy recipe book is full of mouth-watering ideas - you won't be stuck for a snack again!